United Launch Alliance’s Delta IV rocket lifted off Friday carrying the U.S. Air Force’s satellite communications platform designed to support U.S. forces and allied troops. 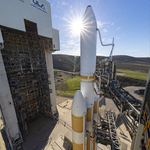 Delta IV carried the service’s 10th Wideband Global Satcom satellite, built by Boeing, from Space Launch Complex-37 at Cape Canaveral AF Station in Florida, ULA said Friday. Aerojet Rocketdyne provided two engines that powered Delta IV while Northrop Grumman supplied four solid rocket motors, two heat pipes and payload pallet boom tubes. “We are very proud to deliver this critical asset to orbit in support of the U.S. and Allied warfighters deployed around the world defending our national security,” said Gary Wentz, vice president of government and commercial programs at ULA. Charlie Precourt, vice president of propulsion systems at Northrop, said the launch serves as a significant achievement that exemplifies the company’s ability to contribute key technologies to support warfighters. The satellite will join a WGS system designed to have more capacity for wideband communications compared to the Defense Satellite Communications System. ULA has provided launch services to support all of the Air Force’s prior WGS satellites.